In my last ‘Desmond’s Quotes’ post, I spotlighted bassist Eugene Wright and his spectacular and festive references in his bass solo, showing that Paul Desmond wasn’t the only one that could get off fun and witty quotes. I also mentioned how cool it would be if the drummer from one of Brubeck’s groups had somehow put a Christmas quote into their drum solo. That would be crazy right? I mean, a drummer somehow putting any song into a drum solo would be impressive. So imagine my surprise when I heard Joe Morello do just that. More than once. Yep. Joe Morello was the drummer with Brubeck’s group from the fall of 1956 through the end of Brubeck’s Quartet in December 1967, and in that time he established himself as one of the best jazz drummers of his time. People openly wondered if he was better than Buddy Rich. To Buddy Rich’s face. Morello was no joke. Morello’s presence in the quartet permanently altered it’s sound, much to Desmond’s dismay, but for many fans it was for the better. He was a melodic drummer; it never sounded like he was just banging or doing something for the heck of it or to show off his chops. He was actively improving like a horn player, which made his solos interesting to listen to. His logic and taste was right at home with the logic and taste of Desmond and Brubeck, even if it seemed like the opposite was true. That brings us to this recording, made illicitly in the spring of 1959. 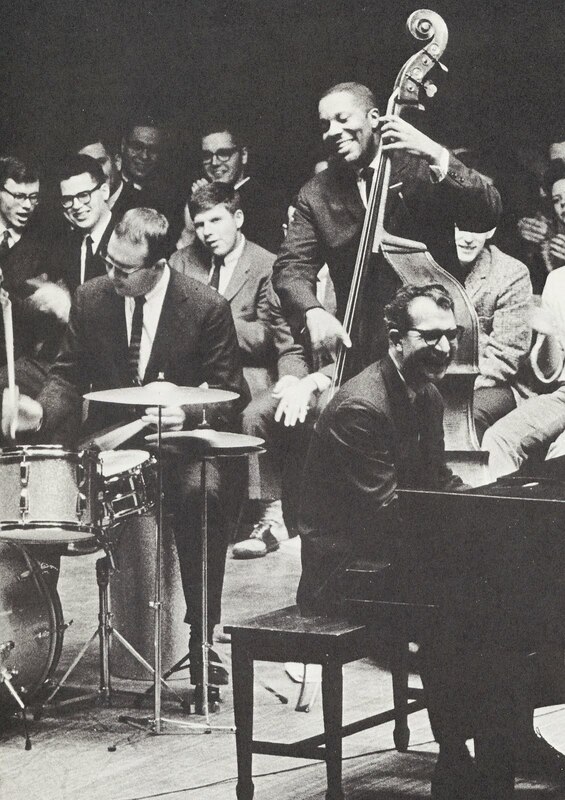 The Dave Brubeck Quartet was appearing at the Multnomah Hotel in Portland, Oregon for two nights in April. A radio broadcast was made during their time there, and some made a bootleg from the radio, giving us a rare glimpse of the quartet on the road playing for themselves as much as for the small group of people before them. The tune of note is “Take The ‘A’ Train”, Duke Ellington’s theme song that Brubeck kept in his book from 1954 till his death in 2012. As Brubeck starts up, the audience shows their approval through applause. Desmond launches into a minor lick during the solo break, and Brubeck follows with the appropriate chordal comping. Desmond’s solo is pretty wild at points, particularly towards the end. It starts off cool and simmering, becoming more heated with each chorus. His last chorus is the craziest and funniest, ending unexpectedly. Brubeck’s ensuing solo is lengthy but exciting, with NUMEROUS quotes and references sprinkled throughout. It’s obvious he’s having a good time. His good-natured attitude becomes infectious when Morello and Brubeck begin a long series of four-bar exchanges. They spontaneously decide to slow the tempo down, with Brubeck playing various tunes during his four (now technically two since the time was halved) bars. I assume they’re quotes of different tunes, since the audience goes into hysterics after each thing he plays. I don’t recognize any of those, but I do recognize some of the other tunes Brubeck quotes, which includes “I Hear Music”, “How About You”, “Dixie”, “Bark For Barksdale”, “Happy Birthday To You”, “Standing On The Promises”, “It Don’t Mean A Thing If It Ain’t Got That Swing”, and others. It’s during these trading of fours that Morello decides to engage Brubeck in some fun of his own, using one of his tom-toms to tap out the melody to “Jingle Bells”. The audience is amazed and in their loud approval, Brubeck’s equally impressive reply on the piano almost gets drowned out. Like wow. Morello even manages to play the melody of “Shortnin’ Bread” on the drums, which Brubeck copies on the piano. He then copies Brubeck’s quote of “Bark For Barksdale”. The audience drank it all up, hooting and laughing heartily. It’s an awesome and fun festive quote. It just shows how the entire group was on the ball and listening to each other. The sound quality isn’t great, yet it’s still in stereo. 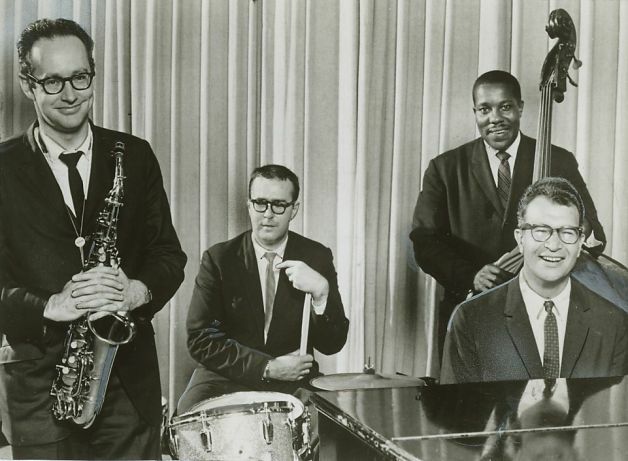 Legendary sound engineer Wally Heider recorded Brubeck’s group that night and a few more times that month as they toured the Pacific coast, and those tapes are in glorious, life-like stereo. They’re available for listening at the Library of Congress in Washington D.C., but aren’t available commercially. Well, until a bootleg album of recordings from their Portland OR appearance showed up a few years ago. Where and how? I don’t know and I don’t care. I’m happy these recordings of the group are around. Here is the marathon outing on “Take The ‘A’ Train”, followed by the songs that they quote, in order of appearance. See how many you can find!